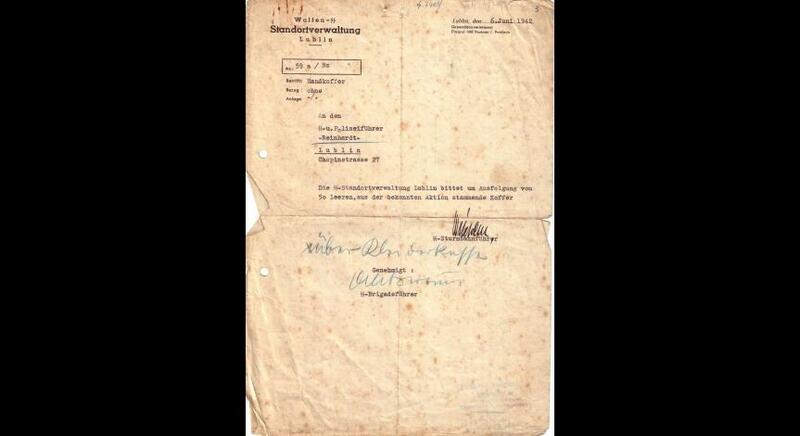 Lublin played a special role in the “final solution of the Jewish question.” It also served as the command and logistics centre for the "Aktion Reinhardt" aimed at the liquidation of the Jews in the General Government. Odilo Globocnik, the SS and police commander in the Lublin district, was responsible for the implementation of this plan. 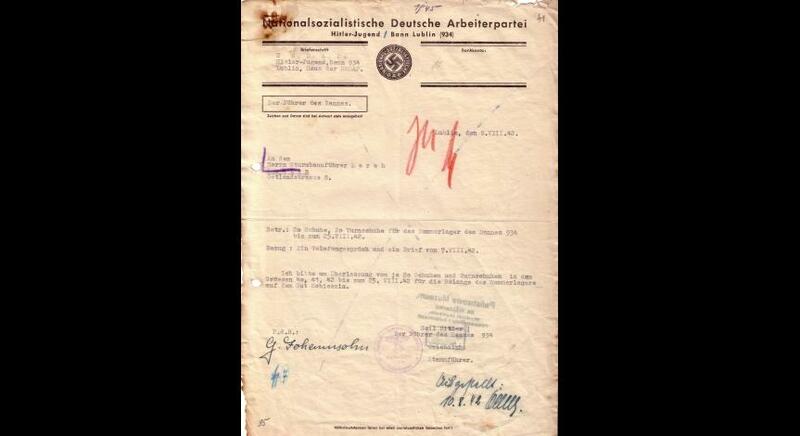 His tasks included establishing death camps, deporting Jews and taking over their property in favour of the Third Reich. 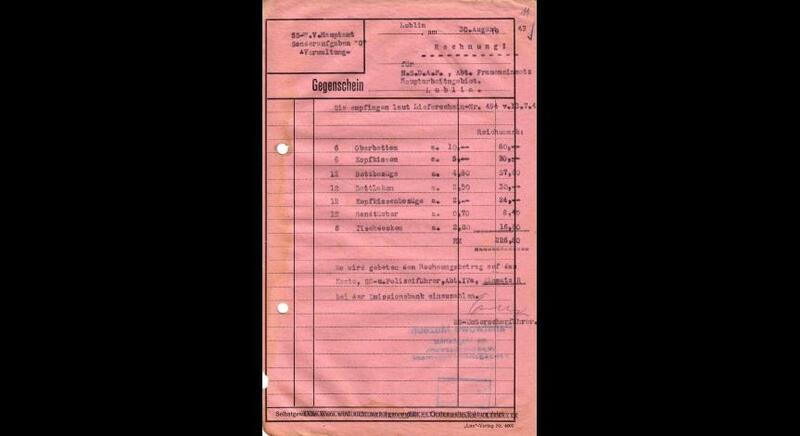 In the autumn of 1941, Globocnik started to organize the operational headquarters. He chose a building in the Julius Schreck-barracks on the corner of Cicha and Pierackiego (now 1 Armii Wojska Polskiego). 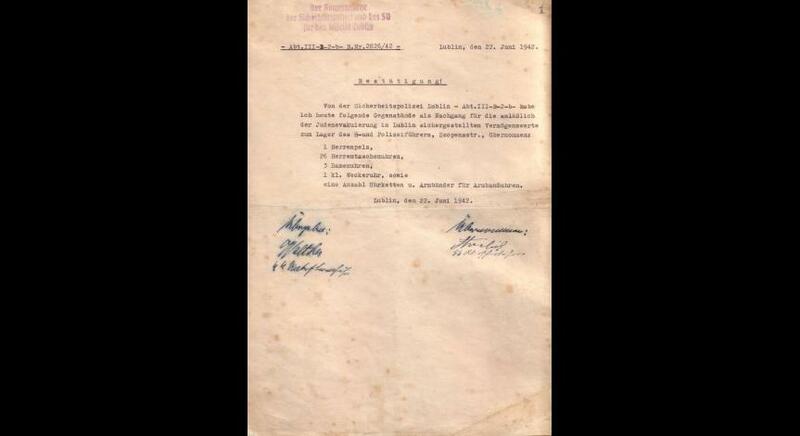 At the office of the SS and police commander in the Lublin district, “Hauptabteilung Einsatz Reinhardt” [“Main Department of Operation Reinhardt”] was established. 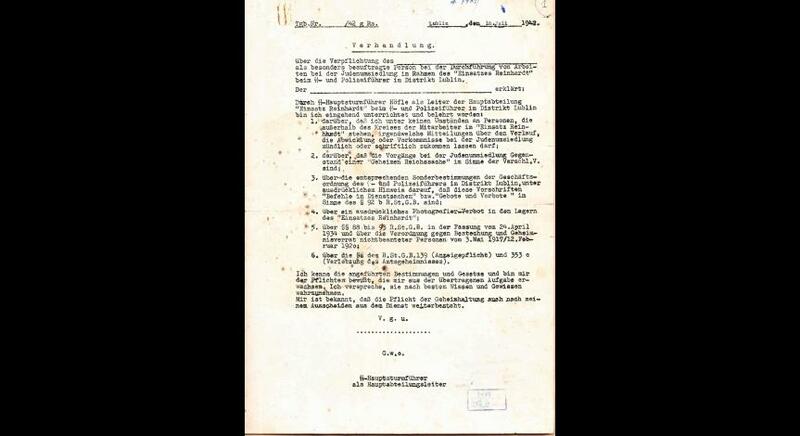 Herman Höfle, who was responsible for the logistics of the transports with deported Jews, became its head. On the other hand, Christian Wirth, later replaced by Georg Wippern, was responsible for the acquisition of Jewish property. 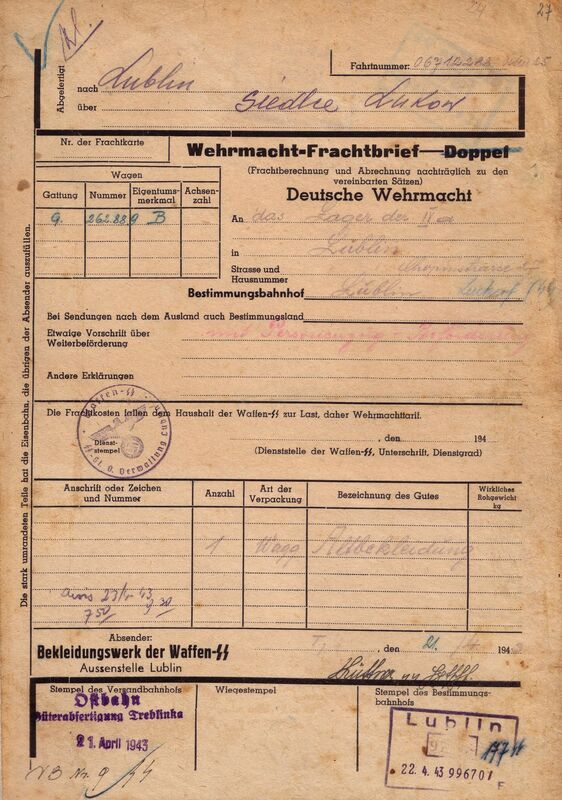 Clothing and everyday items were to go to the Main Economic-Administrative Office (WVHA – Wirtschafts- und Verwaltungshauptamt), while foreign currency and valuables to the Reichsbank. 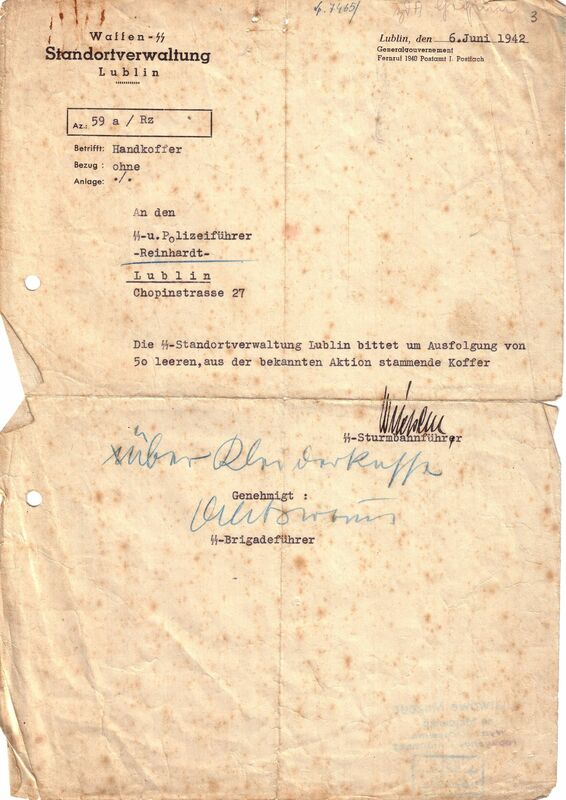 Under the Globocnik’s order of July 15, 1942, the camp administrations involved in the implementation of the extermination of Jews were required to record the stolen Jewish property. 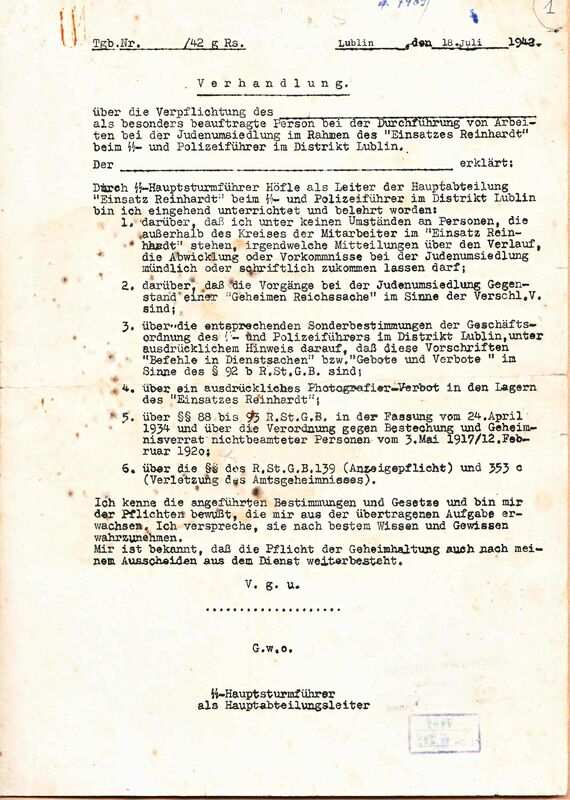 At the headquarters of the "Aktion Reinhardt," two central units were established. The first one accepted foreign exchange, bullion, precious stones and other valuables, while the second one – clothing, footwear and household equipment. SS-Sturmbannführer Georg Wippern was head of the first one, and SS-Hauptsturmführer Herman Höfle became head of the second one. These units led files, which functioned within the division IVa i.e. 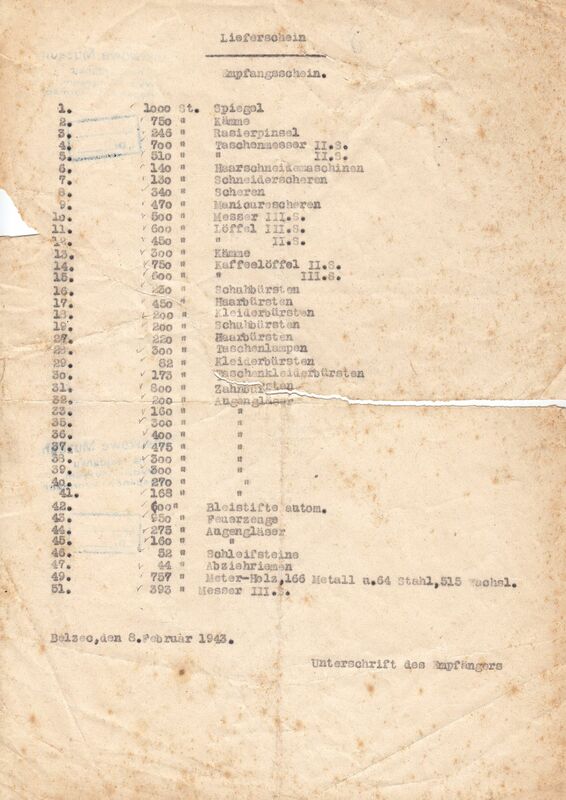 the SS garrison administration, which also led files of the “Aktion Reinhardt” storage at Chopina Street 27 in Lublin, where goods robbed from the Jews were collected and sorted. 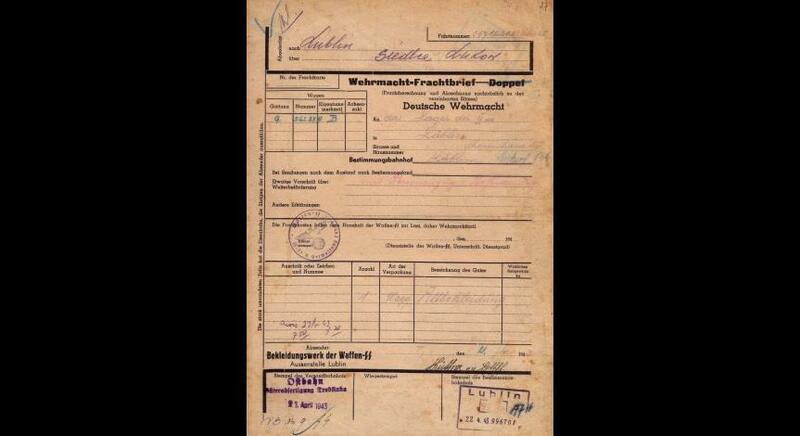 The full name of the store was “SS- und Polizeiführer Lublin. Einsatz Reinhardt – Materiallager Chopinstr. 27” [SS and Police Commander in Lublin. Operation Reinhardt – Materials Store at Chopina Street 27]. SS-Unterscharführer Fritz Dorl became its supervisor. German stations and institutions drained on the store resources. They lodged appropriate applications to the division IVa and then the division accepted them and commissioned their realization. 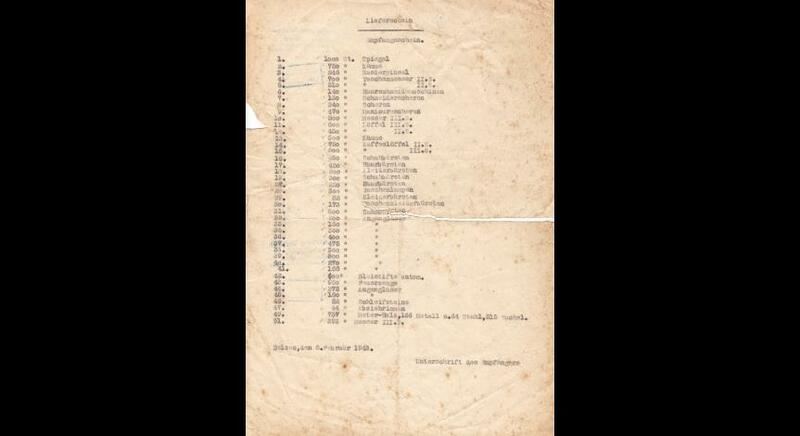 Documents relating to recording and managing the Jewish property robbed while the “Aktion Reinhardt” are a part of the archival resources of the State Museum at Majdanek. 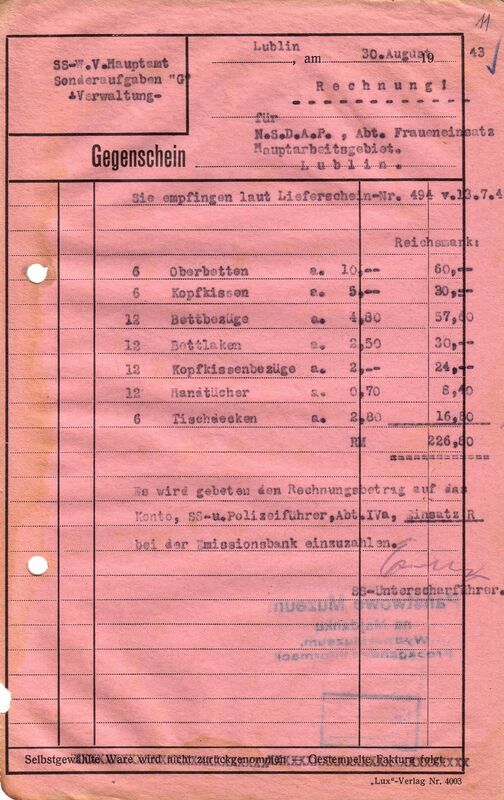 There are 14 archival units, which gathered among other things: regulation of the division IVa concerning administration and leading a central file of material goods, lists of valuables and money robbed from the Jews, the book of clothing and equipment of 1942 and a notebook with the names of Jews employed in the store as guards in the period from December 1942 to April 1943. 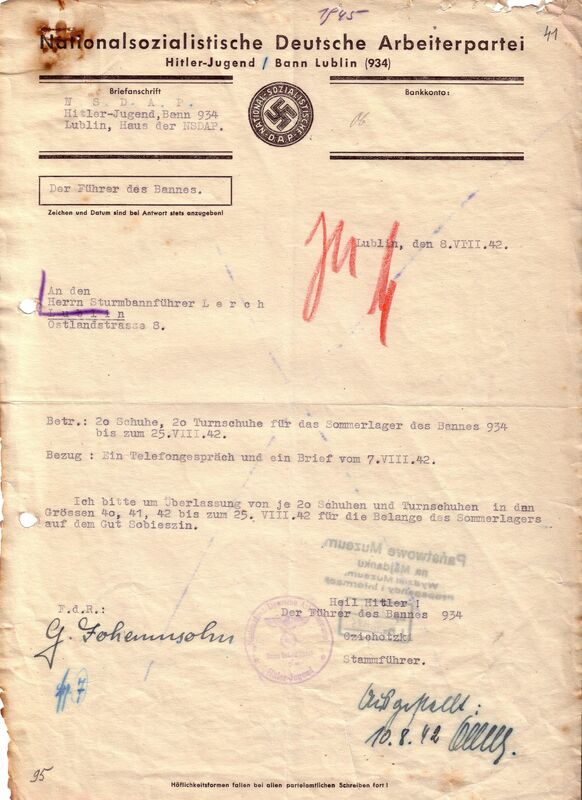 Another group of files constitutes the demand for different things from stores and authorizations of department IVa to surrender them, copies of bills for the items sold issued by the office of the SS and police commander in 1943, as well as receipts of customers using store resources in the years 1942–1943. 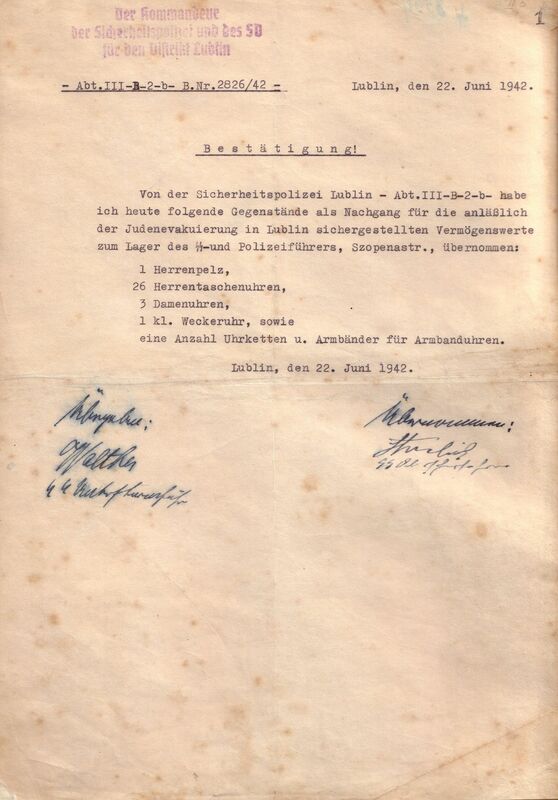 One of the most interesting documents is a form of protocol containing the nondisclosure clause, which was signed by each person involved in the implementation of the “Aktion Reinhardt.” A delivery and acceptance protocol with the list of subjects robbed from the Jews imported to the Bełżec death camp is also a document that gains lots of interest and attention.